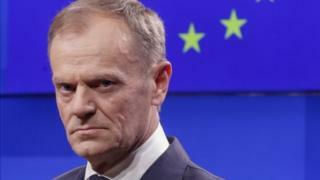 European Council president Donald Tusk says the EU should consider offering the UK a "flexible" delay to Brexit of up to a year, with the option of leaving earlier if a deal is ratified. "One possibility would be a flexible extension, which would last only as long as necessary and no longer than one year, as beyond that date we will need to decide unanimously on some key European projects." He said the UK should be treated "with the highest respect" and "neither side should be allowed to feel humiliated". BBC Europe editor Katya Adler said the EU's draft conclusions "should be taken with a big pinch of salt" as EU leaders could "rip up the conclusions and start again" on Wednesday. Downing Street said Mrs May had discussed the UK's request for an extension of Article 50 - the process by which the UK leaves the EU - until 30 June, with the option to make it shorter if a deal is ratified earlier, with both Ms Merkel and Mr Macron. 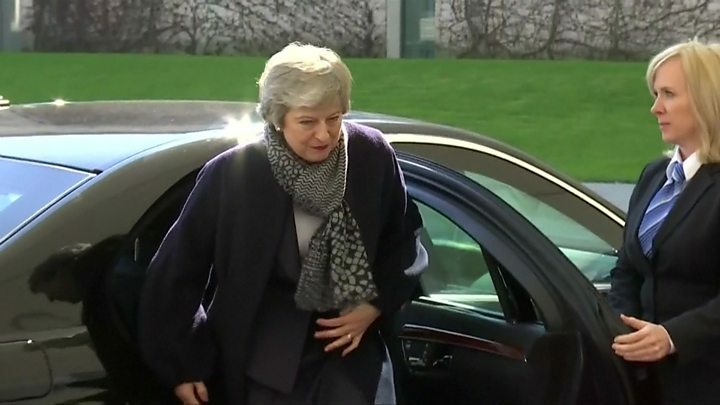 Mrs May and Mr Macron also discussed next month's European Parliamentary elections, with the prime minister saying the government was "working very hard" to avoid the need for the UK to take part as it is supposed to if it is still a member of the EU on 23 May. They want to know, if they say, "Yes," to another Brexit extension, what it will be used for. On Tuesday afternoon, MPs also approved a government motion for Mrs May to ask the EU to delay Brexit until June 30, required after a bill from Labour's Yvette Cooper became law. If Labour and the government cannot agree on a way forward, Mrs May has promised to put a series of Brexit options to the Commons to vote on - with the government to be bound by the result.